Where do I begin with this update? I can’t believe that I have landed and have been in Mozambique for the past two weeks. The entire occasion has been such a head rush. I brought my birthday in traveling through three countries and having an amazing group of people who had just meet me, wake me up in the airport with a serenade of guitar and a Happy Birthday song! From there forward I knew I would be fine. After we landed in Maputo, we stayed in a gorgeous hotel with a beautiful view of Maputo and the Indian Ocean, there we received a few trainings. After two days we left to the city of Namaacha, Mozambique, located at the southern tip of Mozambique, on the Swaziland Border. There I meet my host family. 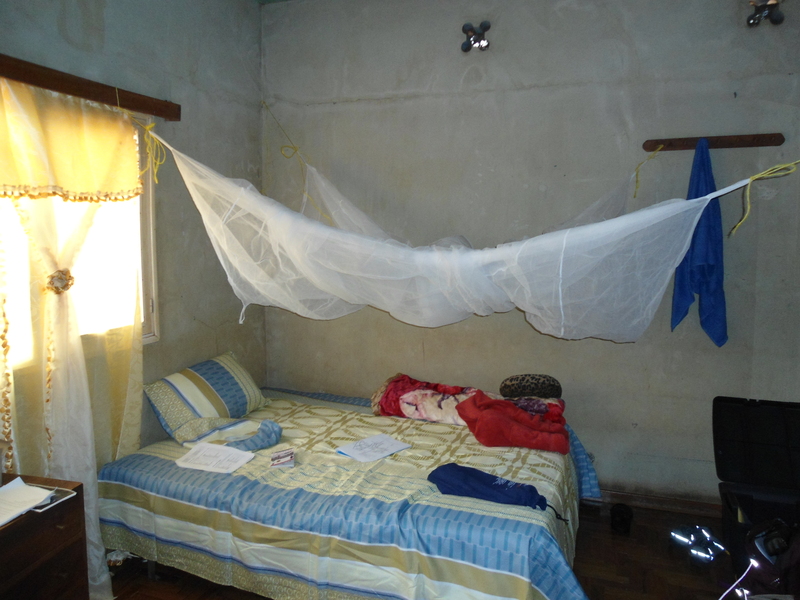 Each Peace Corps Volunteer Trainee is given a host family to live with and to show them the ropes of living in Mozambique. My host family is a beautiful woman named Cecilia and her granddaughter Nelly. I call them minha mae and minha irhma. I absolutely love them! !They are sweet and kind, and patient with the fact that I have no idea what they are talking about! Yes, they speak full Portuguese and I kind of just sit and nod my head and smile. 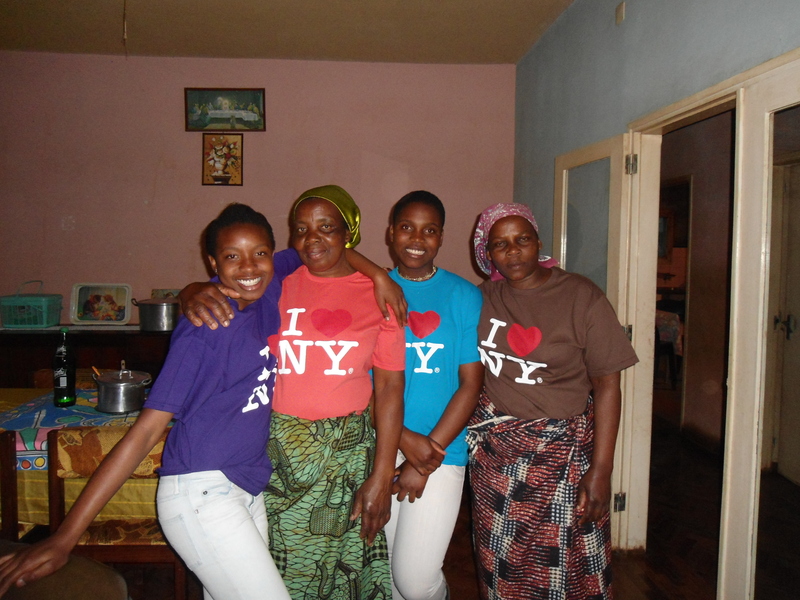 In the pictures they are wearing the purple and orange, “I love NY” t-shirts that I gave them as presents. In return, I received a capulana, which is the traditional wrap that women wear around their waists or heads, but really is also used as a basket, bag, baby carrier, blanket, pillow, purse, shirt and anything else your heart could imagine. I am living in a house with a bathroom and not a pit latrine, which I was slightly disappointed about. But I do get to take bucket baths, which I now believe are the only proper way to get fully clean. Why wasn’t I taking bucket baths before??!!! I will be in Namaacha for three months. Here I am taking extensive language courses and technical training. My struggle of course is the language. I won’t lie I am completely worried about it. Many of the volunteers that have come are fluent in Spanish and so are transferring that skill easily. I, on the other hand, have 6+ years of no language study. Every other morning I run along the border of Swaziland and Mozambique. It is gorgeous here. The people are beautiful, the country has its own soul. The history of Mozambique is violent and here in Namaacha, you can see places where the war, colonialism and poverty has taken its toll, but the people of Mozambique are resilient and open. I am obsessed with the history you can see in the houses. There is also no way to sum up my experiences in just these updates, or my blog but I hope that you in a way feel the soul of the country with me as I write you. I have received on letter from one of my students already. It took a month to get here.. lol, but it got here. I don’t have regular internet access, but when I get an email or a letter I will try to respond. I am working on my blog but I don’t want it to just be a diary entry, I want to capture something, and I’m not sure what yet. When I figure it out, I will update. Until then, enjoy the pics!